After working on the Singing Bone very hard for the past few months, I’m happy to say that I can finally see the light at the end of the tunnel for the first poster (or mini comic) that I have been working on depicting Simpleton’s confrontation with the wild boar. I have mixed feelings about the future… I anticipate excitedly the freedom I will gain (like possibly moving away from vector driven art) but I also have some reservations about making changes that would depart drastically from what I have already created. One thing is for sure is that once I am done with this phase, I will probably enter a period of considering various approaches going forward. I doubted myself along the way a lot, but I’m glad that I seem to be on my way to finishing what I started. I think my drawing for the last panel was a reaction to an early draft that I mocked up of the whole story that I had compiled so far. The grid that is created by the rectangle drawings was starting to feel a bit rigid. I wanted to end this part of the story with the same ‘openness’ as I started it, and I decided to get rid of the border around the drawing. also, I am growing attracted to black, and I liked how the darkness felt like it was swallowing the subject of the piece, almost fading away. Instead of having Simpleton present the boar’s head to his brother as I had originally done, I decided to leave their part of the story off with a little cliffhanger as to what Simpleton might be starring at. Despite feeling a bit shy about these early stages, I still wanted to post the results of my efforts. I had completed first series of illustrations but I was not satisfied with them. In April 2013, after taking some distance from the project, I had finished another set of revisions that affected each drawing of the comic (image on the right). I darkened the backgrounds, re-drew the faces of Simpleton and his brother and also tried to make the colours more vibrant. Between the long hours that I was doing at my day job, my personal life, and the slow pace of my drawing (mostly due to a lack of practice), work on the Singing Bone was not moving ahead very quickly. As I mentioned in an earlier post, I no longer envisioned the project as being a series of independent illustrations for the purposes of approaching Art Directors. I was starting to see it more like a comic, or at least, like a series of images which would be seen simultaneously. That being said, there was too much time going by between panels for it to be as fluid as I’d hoped. I was appreciating the direction that the colouring was taking with the stronger contrast but the drawings were still not what I hoped they would be. Once again, I would need to start over, but not before distancing myself from the project due to frustration. I had no history to build on, no momentum to go forward with as I was constantly stopping myself and restarting, and there was still so much to do before I could finally arrive at the end of the story I had in mind. 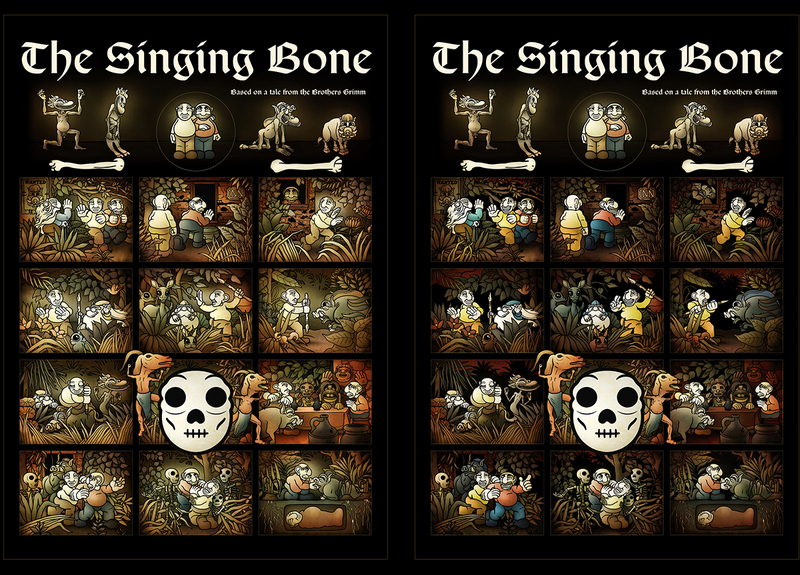 My other, more realistic, illustrations were getting positive attention, but despite that, after some time, for some reason, I would always come back to the Singing Bone. I had not resolved the visual problems I was giving myself and it felt unresolved. The vision I had of where I wanted to take the story appealed to me. Ideas are stronger than pretty pictures, I suppose. 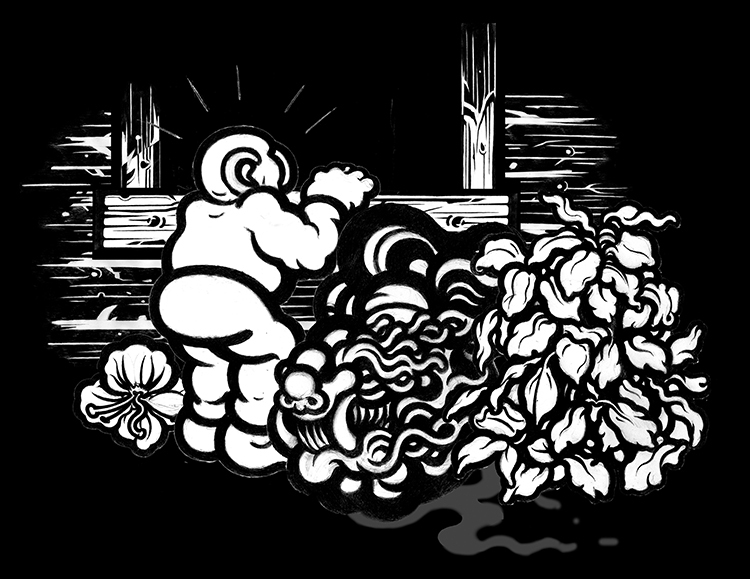 My biggest challenge in developing the first story was that I was constantly working backwards. I have to confess that I am still facing that constraint today as I am still working on the first part of the story which consists of Simpleton killing the boar. I was not sure where I was heading when I first started. I was fortunate to make some great discoveries along the way but I was constantly revising myself and starting over. I look forward to start the next section knowing a bit more where I want to go and the shape that it will take in the end, and I think it will serve the project well. In the meantime, my hope is to finish this first part in the best way I can.